Excelsior is a leading provider of pre-designed, rotomoulded plastic products to customers across a wide range of industries. But did you also know that we offer a bespoke rotomoulding service? 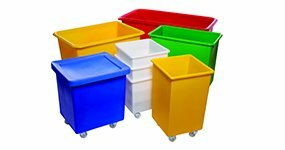 Our in-house design and production team can liaise with you to create unique, sturdy and affordable plastic items according to your exact specifications as part of our service. Our design and production team uses the latest in Computer Aided Design (CAD) technology to help create the exact product you need. We can clearly visualise your product before it’s even been made, and carry out precision adjustments to ensure that it meets your unique criteria and results in a product that will stand the test of time. Not only can we use CAD technology to showcase your product in the virtual – we also offer 3D printing services so you can demonstrate your prototype design to colleagues and customers before investing in our contract moulding service. Almost any digital model can be translated into 3D printed form. We can also 3D print parts of larger items, or individual components of more complex items, on a smaller scale, allowing you to take a closer look at those tiny details before you finalise them. Having a solid prototype to show to customers and colleagues can help bring a project to life, not to mention helping you to identify any potential issues with your product’s application and avoid costly design mis-steps. Rotomoulding has a lot to offer as a plastics manufacturing process: it’s simple, economical and versatile, which makes it a great choice for one-off products and small to medium batch runs, not to mention small and start-up businesses. A flexible process, rotomoulding can be used to create an infinite number and range of products – size, shape and texture can all be customised to your requirements, and the resulting items are seamless, sturdy and uniform. From single items to bulk orders, our contract moulding service can be tailored to your exact needs, and always with the same great results. With over 40 years’ experience in rotomoulding, there’s not much that we haven’t seen here at Excelsior, which is why we’re such a popular provider of contract moulding services. But despite the fact that we’re a leader in the rotomoulding industry, we’ve never lost sight of where we came from. We’ve kept that friendly, family business feel, and that’s something else our customers love: the personal service and attention that each and every product we manufacture receives. During our many years in business, we’ve designed and created a huge range of products, from simple water floats to military anti-tank missile cases. There’s almost no limit to the range of applications our products can be used for – we’ve worked with clients in the sports, health and fitness industries, the expo market, the pet-care sector and the construction industry. So when we say we’ve seen it all, we mean it! Interested in our Contract moulding services? Contact our design and production team on 0161 765 2010 today.